The tuxedo shirt deserves more credit. It’s often upstaged by the formal wear that surrounds it, but the shirt is the foundation of the entire tuxedoed look. 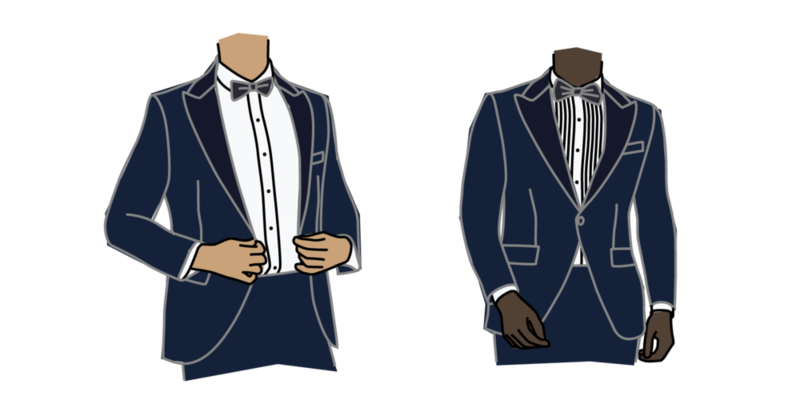 While some rules of the tuxedo shirt are set in stone—such as their white color—there are a range of customizations, ranging from swank to subtle, that can stamp evening wear with your own personality. Traditionally, tuxedo shirts have been pleated. The pleats add extra visual interest and help to set tuxedo shirts apart from your other dress shirts. But they’re a matter of preference, not mandatory: if you’d prefer to have a cleaner look, opt for the non-pleated option. Tuxedo shirts can have the standard placket presentation you see in most dress shirts or a covered placket. The covered placket functions the same way a standard placket would but has an extra strip of cloth on top to conceal the buttons. This creates a sleeker, more contemporary look. Perhaps the most unique aspect of a tuxedo shirt is its removable button strip. The button strip can be attached and detached from the placket, which gives you the option of using tuxedo studs to add an extra touch of flash.